The challenging East Asian security environment compounds these problems. Not only do China, Japan, and Korea have a history of mutual animosity, but they have diverging relations with important third parties, such as Russia and the United States. South Korea and Japan are close U.S. allies; China and Russia, though not formal military allies, oppose much U.S. defense cooperation with South Korea and Japan, such as their collective missile defense initiatives. The deepening U.S. competition with Beijing and Moscow has significantly narrowed Seoul’s and Tokyo’s room to maneuver. Unsurprising, given these constraints, this trilateral summit mechanism has consistently yielded only modest low-key cooperation, such as regarding deepening economic ties and managing transnational challenges. The three-way summits, supposed to meet annually, failed to occur at all in 2016 or 2017 due to insurmountable Sino-Japanese differences such as their competing territorial claims in the East China Sea. Past agreements in principle to develop a “defense dialogue mechanism” or an agreed position on North Korea have failed to pan out. When faced with North Korean threats and provocations, Seoul and Tokyo have understandably relied on their defense connections with Washington rather than their complex relations with Beijing, which has too often shielded North Korea, or their tense and troubled bilateral ties with each other. This bifurcation underscores the so-called “Asia Paradox”—that regional economic interdependence has consistently failed to yield much security cooperation. Even the ASEAN+3 structure, which links these three countries to the more successful ASEAN structure, or the East Asia Summit, the ASEAN+3’s security branch, has few concrete commitments for joint action. Though the most recent summit appears more successful than many past trilateral meetings. 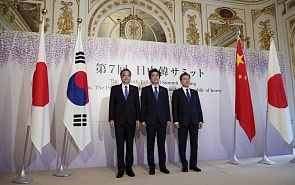 Japan’s Prime Minister Shinzo Abe, South Korea’s President Moon Jae-in, and Chinese Premier Li Keqiang all stressed their desire to cooperate on critical issues. Premier Li’s and President Moon’s arrival in Japan marked the first such high-level visits by Chinese and Korean leaders in more than a half-dozen years. It also yielded a welcome commitment to create a direct crisis communication line to address possible clashes in the East China Sea. The three leaders have become concerned by the U.S. administration’s aversion to free trade and public goods. These developments have renewed interest in attaining a trilateral free trade agreement and sharing perspectives regarding North Korea in advance of next month’s Trump-Kim summit in Singapore. Each of the three countries has additional distinct reasons to seek improved trilateral ties. Beijing has become alarmed by the confrontational posture of President Trump toward a range of Chinese interests. Seoul is striving to overcome recent Sino-Korean tensions that have imposed major economic and diplomatic costs on South Korea. Since Abe’s efforts to reconcile with Moscow have stalemated, Tokyo is more interested in reducing tensions with Beijing and Seoul. Notwithstanding recent developments, however, the deep divergences underlying the China-Japan-ROK trilateral mechanism will likely keep it overshadowed by the U.S. bilateral alliance ties, the ASEAN-related multilateral structures, and the Chinese Belt and Road Initiative.